The National Museum of Australia, in the national capital Canberra, preserves and interprets Australia's social history, exploring the key issues, people and events that have shaped the nation. It was formally established by the National Museum of Australia Act 1980. The museum did not have a permanent home until 11 March 2001, when a purpose-built museum building was officially opened. The museum's innovative use of new technologies has been central to its growing international reputation in outreach programming, particularly with regional communities. From 2003 to 2008, the museum hosted Talkback Classroom, a student political forum. 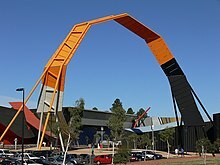 The museum is located on Acton Peninsula in the suburb of Acton, next to the Australian National University. The peninsula on Lake Burley Griffin was previously the home of the Royal Canberra Hospital, which was demolished in tragic circumstances on 13 July 1997. Central "garden" of the National Museum of Australia (Garden of Australian Dreams). As designed by architect Howard Raggatt (design architect and design director for the project), the museum building is based on a theme of knotted ropes, symbolically bringing together the stories of Australians. The architects stated: "We liked to think that the story of Australia was not one, but many tangled together. Not an authorized version but a puzzling confluence; not merely the resolution of difference but its wholehearted embrace." The building is meant to be the centre of a knot, with trailing ropes or strips extending from the building. The most obvious of these extensions forms a large loop before becoming a walkway which extends past the neighbouring AIATSIS building ending in a large curl, as if a huge ribbon has haphazardly unrolled itself along the ground. Known as the "Uluru Axis" because it aligns with the central Australian natural landmark, the ribbon symbolically integrates the site with the Canberra city plan by Walter Burley Griffin and the spiritual heart of indigenous Australia. The shape of the main entrance hall continues this theme: it is as though the otherwise rectangular building has been built encasing a complex knot which does not quite fit inside the building, and then the knot taken away. The entirely non-symmetrical complex is designed to not look like a museum, with startling colours and angles, unusual spaces and unpredictable projections and textures. Though hard to precisely categorise, the building can be seen as an example of Charles Jenck's "new paradigm". Some characteristics of Deconstructivism can also be identified. the Aboriginal Dreamtime story of the Rainbow Serpent making the land. The plan of the National Museum of Australia incorporates an exact copy of the lightning-flash zigzag that Libeskind created for the Berlin Museum by breaking a star of David. The Bulletin magazine first publicly raised allegations of plagiarism in June 2000. Libeskind was reported to be angry with the copying. Raggatt's defence against plagiarism was that the design was a quotation rather than a copy. The director of the museum, Dawn Casey, claimed in the press that she and her council were not aware of this symbolism when they approved the plan. The exterior of the building is covered in anodised aluminium panels. Many of the panels include words written in braille and other decorative devices. Among the messages are "mate" and "she'll be right". Also included were such controversial words and phrases as "sorry" and "forgive us our genocide". These more controversial messages have been obscured with silver discs being attached to the surface making the braille illegible. Among the phrases in braille are the words "Resurrection city". The phrase may refer to the clearing of the former Canberra Hospital to make way for the museum or it could be a reference to reconciliation between Indigenous Australians and European settlers. The phrase is used as a label in tiles on another of Raggett's buildings, the Storey Hall in Melbourne. Raggett says of that message: "I guess that tries to be some big sort of theme for this building as well and its sort of set of memories." It was built by Bovis Lend Lease and completed in 2001. A severe thunderstorm hit Canberra on the afternoon of 29 December 2006 and caused roof damage to the administration section of the museum. The ceiling collapsed under the weight of hail. The damage exposed power cables and left two centimetres of water on the floor. The water also damaged several paintings by a Sydney artist which were associated with an exhibition about Australian lifesavers. However, the main part of the building was unaffected and nothing from the museum's collection was damaged. The building was re-opened to the public a day later. The damage was expected to cost at least A$500,000 to repair. In 2012, building works commenced on a new cafe and administration wing. The new cafe opened in late 2012. It overlooks Lake Burley Griffin and offers both indoor and outdoor dining. The relocation of the museum's cafe freed up the vast entry Hall for the display of large objects from the museum's collection, including vehicles. The new administration wing, which links the main building with the existing administration building, was completed in mid-2013. The new building is clad in rightly-coloured tiles arranged in a QR code pattern. The museum also functions as a temporary repository for the repatriation of ancestral remains. It is involved in projects to return the remains of indigenous Australians, held in the collections of museums across the world, to their communities of origin. These projects have seen the return of over 1400 remains as at March 2019. Museum Workshop: examined the behind-the-scenes world of the conservators responsible for the physical care of objects in the museum's collection (October 2012 - January 2013). In the annual Australian Tourism Awards, the National Museum was named Australia's Major Tourist Attraction in both 2005 and 2006. The museum was named winner of the Canberra and Capital Region's Tourism Award for Major Tourist Attraction five years running from 2003-2007. ^ Ashton Raggatt McDougall. Robert Peck von Hartel Trethowan. Architects. (2002). "National Museum of Australia – in the architects' words". Project entry. architecture.com.au. Retrieved 1 December 2006. ^ a b Anne Susskind quoted in Rimmer, Matthew (2002). "Crystal Palaces: Copyright Law and Public Architecture" (PDF). Bond Law review, December 2002, volume 14, no. 2. Bond University. Archived from the original (pdf) on 20 May 2006. Retrieved 15 June 2006. ^ Sudjic, Deyan (4 March 2001). "Australia looks back in allegory at its inglorious past". Architecture. London: The Guardian. Retrieved 11 June 2006. ^ Windschuttle, Keith (2001). "How not to run a museum". thesydney line republishing article that first appeared in Quadrant. Archived from the original on 20 August 2006. Retrieved 11 June 2006. ^ Devine, Miranda (2 April 2006). "Disclosed at last, the embedded messages that adorn museum". Opinion. Sydney Morning Herald. Retrieved 11 June 2006. ^ "Episode 1: Keeping the faith (Program transcript)". In the mind of the architect. Australian Broadcasting Corporation. 2000. Retrieved 12 June 2006. ^ "Collection | National Museum of Australia". Retrieved 13 April 2019. ^ "Collection highlights | National Museum of Australia". Retrieved 13 April 2019. ^ "Repatriation | National Museum of Australia". Retrieved 13 April 2019. ^ "UK's Natural History Museum returns remains of Indigenous Australians to elders". SBS News. Retrieved 13 April 2019. Wikimedia Commons has media related to National Museum of Australia.